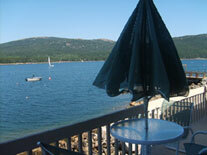 As close as you can be to Somes Sound! 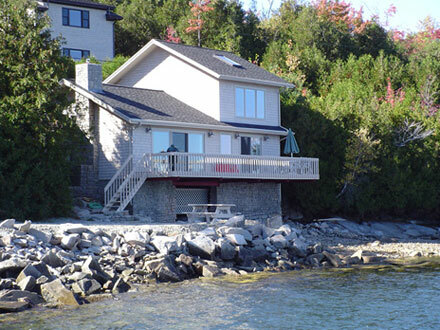 Charming cottage with modern amenities right on the shore of Somes Sound. Sitting so close to the ocean that at high tide the water is underneath the deck; this cottage features a large furnished deck with breathtaking water and mountain views; a gas fireplace; stunning modern lighting; luxurious linens; whirlpool tub; plasma and LCD flat screen televisions with DVR (Tivo). Room darkening blinds are provided throughout the cottage. Jibe Ho is exquisitely decorated with soothing colors. 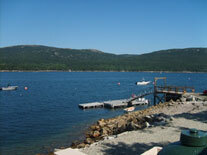 Full access to a dock and float; mooring rentals. Fresh lobster is available for sale; right off the dock. 1st floor-Kitchen, Dining area, Fireside sitting area, King bedroom, Bathroom with whirlpool tub and separate shower, bunk room with 2 twin beds. Open airy floor plan. 2nd floor-King bedroom with electric skylight, Bathroom with shower and double sinks. Most of the MCM Rentals staff has a much loved pet at home; and we understand owners wanting to bring their pets. However, we kindly ask that guests obey the no pet policy to avoid a $200 fee and possible eviction. Late check out will be charged against security deposit. Excess cleaning will be charged against security deposit.